[S542] Index - New Zealand BDMs online, at http://www.bdmhistoricalrecords.dia.govt.nz/, Birth Reg. No. 1880/4295. [S542] Index - New Zealand BDMs online, at http://www.bdmhistoricalrecords.dia.govt.nz/, Death Reg. No. 1910/6426, aged 30. [S801] Newspaper - Auckland Star, issue of 11 Nov 1910, issue 268, Vol XLI, p2, col1, Deaths, aged 30. 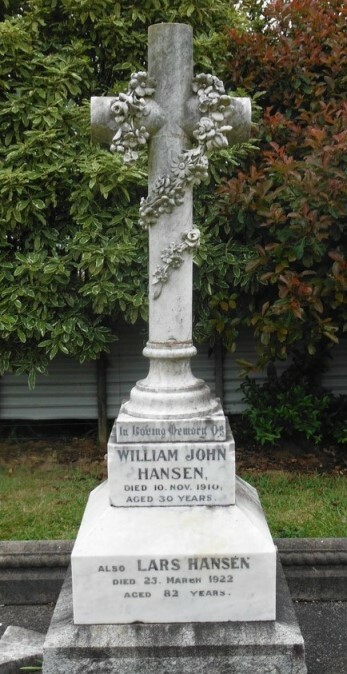 [S1111] Waikato District Council cemetery database, at https://www.waikatodistrict.govt.nz/services-facilities/…, Rangariri Lawn Cemetery, Block 1, plot B. [S443] CD - NZ Marriages, CD - NZ Marriages 1836-1956 V2, Folio 03883. [S542] Index - New Zealand BDMs online, at http://www.bdmhistoricalrecords.dia.govt.nz/, Birth Reg. No. 1900/10890 daughter to Edwin and Sarah Emily. [S542] Index - New Zealand BDMs online, at http://www.bdmhistoricalrecords.dia.govt.nz/, Marriage Reg. No. 1924/1946. [S542] Index - New Zealand BDMs online, at http://www.bdmhistoricalrecords.dia.govt.nz/, Death Reg. No. 1971/27498, aged 70. [S509] Will - Samuel Forsaith Logan, Agency BBAE, Series 1570, Box 1978, Record 892/1967. [S542] Index - New Zealand BDMs online, at http://www.bdmhistoricalrecords.dia.govt.nz/, Birth Reg. No. 1909/9697; daughter of Albert Edward and Margaret HARDING. [S542] Index - New Zealand BDMs online, at http://www.bdmhistoricalrecords.dia.govt.nz/, Birth Reg. No. 1909/9697, and Death Reg. No. 1989/34502 gives this birthdate; daughter of Albert Edward and Margaret HARDING. [S443] CD - NZ Marriages, CD - NZ Marriages 1836-1956 V2, NZ Registrar General's Folio 2426. [S542] Index - New Zealand BDMs online, at http://www.bdmhistoricalrecords.dia.govt.nz/, Death Reg. No. 1974/26659. [S542] Index - New Zealand BDMs online, at http://www.bdmhistoricalrecords.dia.govt.nz/, Death Reg. No. 1989/34502. [S568] Purewa Cemetery & Crematorium database, at http://www.purewa.co.nz/, Serial No. 56883. [S568] Purewa Cemetery & Crematorium database, at http://www.purewa.co.nz/, Serial No. 56883, Anglican, aged 79, ashes returned. [S853] Ventura County Genealogical Society Archives, at http://www.venturacogensoc.org, Index to Ventura County Marriage Records 1873-1940, Bk 7:465. [S251] Census - 1 Apr 1930, US Census, Santa Paula, Ventura, California, Roll T626-228, Page 28A, ED 14, image 56.0. [S418] Ancestry.com - misc sources, at http://www.ancestry.com/, California Death Index, 1940-1997. [S245] Census - 1 Jan 1920, US Census, Santa Paula, Ventura, California, Roll T625-154, Page 13A, ED 270, image 390. [S844] Census - 1 Apr 1940, US Census, Santa Paula, Ventura, California, Roll T627-364, Page 17B, ED 56-32. [S239] Email - J Thompson, email from Judy Thompson to D Ferguson, 25/11/2001. [S542] Index - New Zealand BDMs online, at http://www.bdmhistoricalrecords.dia.govt.nz/, Birth Reg. No. 1898/4205, and Death Reg. No. 1985/40350 gives this birthdate; daughter of Morton John and Helen Louise. [S443] CD - NZ Marriages, CD - NZ Marriages 1836-1956 V2, NZ Registrar General's Folio 9837. [S265] Book - Edgar T. Jones, George & Martha Clarke Family Tree, p35. [S542] Index - New Zealand BDMs online, at http://www.bdmhistoricalrecords.dia.govt.nz/, Death Reg. No. 1933/11488, aged 40. [S443] CD - NZ Marriages, CD - NZ Marriages 1836-1956 V2, NZ Registrar General's Folio 1929. [S542] Index - New Zealand BDMs online, at http://www.bdmhistoricalrecords.dia.govt.nz/, Death Reg. No. 1985/40350. [S443] CD - NZ Marriages, CD - NZ Marriages 1836-1956 V2, Folio 12873. [S542] Index - New Zealand BDMs online, at http://www.bdmhistoricalrecords.dia.govt.nz/, Death Reg. No. 2013/15274 gives this birthdate. [S542] Index - New Zealand BDMs online, at http://www.bdmhistoricalrecords.dia.govt.nz/, Death Reg. No. 1988/34287. [S542] Index - New Zealand BDMs online, at http://www.bdmhistoricalrecords.dia.govt.nz/, Death Reg. No. 2013/15274. [S1131] MemoryTree NZ, at http://www.amemorytree.co.nz/index.php, aged 92, Davis Funeral Services. [S612] GRO Scotland, birth/bapt record, Parish of Culross, OPR Births/baptisms, GRO 343/00 0020 0523. [S917] GRO Scotland, marriage record, District of Muckart, OPR Marriages, GRO 385/00 0010 0076 FR81. [S612] GRO Scotland, birth/bapt record, District of Saline, OPR Births/baptisms, GRO 455/00 0010 0167, -0172, -0178, -0187, -0197, -0209 and 455/00 0020 0005. [S612] GRO Scotland, birth/bapt record, District of Saline, OPR Births/baptisms, GRO 455/00 0010 0187. [S612] GRO Scotland, birth/bapt record, District of Saline, OPR Births/baptisms, GRO 455/00 0010 0209. [S443] CD - NZ Marriages, CD - NZ Marriages 1836-1956 V2, NZ Registrar General's Folio 7490.